Part of the Parsley and Angelica family&comma; slightly thicker foliage than Parsley with a celery like flavour. 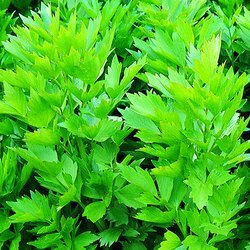 Lovage stays more in clumps with large glossy light green leaves. Lovage can help relieve flatulence&comma; aid digestion and an upset stomach. The leaves can flavour soups and stews. Roots can be used as a vegetable and seeds in baking bread. Late spring only when the leaves are young and fresh. Otherwise they can be bitter. Pick regularly for continuous new growth.